Things look up when a new client, Mr. Saunders, hires Lockwood & Co. to be present at the excavation of Edmund Bickerstaff, a Victorian doctor who reportedly tried to communicate with the dead. Saunders needs the coffin sealed with silver to prevent any supernatural trouble. All goes well – until George’s curiosity attracts a horrible phantom. You can read an excerpt here (just click open preview). I freaking adore this series. The world, the characters – the adventure. The delicious blend of tension of humor. This series has an alchemy all its own, and it is delightful to partake. So once again Lucy, Anthony, and George – the triumvirate of Lockwood & Co – are on the case (and bickering as much as ever), as they tackle yet another ream of things that go bump in the night. And really my favorite thing about these books is that sense of teamwork, as the three of them rub up against each other and generally drive each other crazy, even as they regularly save each other’s lives. I also enjoyed how this story touched on several of the secrets each was holding dear – often to the detriment of the others – and the mistrust and hurt engendered, until reveals were begrudgingly dragged out of all three of them. And so we earn a few more clues about Lockwood’s family history, and learn of unexpected facets of George’s past. And of course, Lucy’s burgeoning talent is very much front and center, as that skull they keep around (the one in the jar) just won’t shut up – though Lucy’s the only one who can hear him. But the clues he whispers, and the larger questions as to why, exactly, he’s telling them all this, add a wonderful sense of malicious intent to the proceedings, even as Lucy’s vacillates between pride and unease at her new ability; as Lockwood’s cocksure arrogance continues to shut both Lucy and George out, and as George’s injured pride continues to hold him apart. And so we can only watch as the skull preys on their vulnerabilities all too easily – and how it seems the people most likely to hurt our trio are themselves. 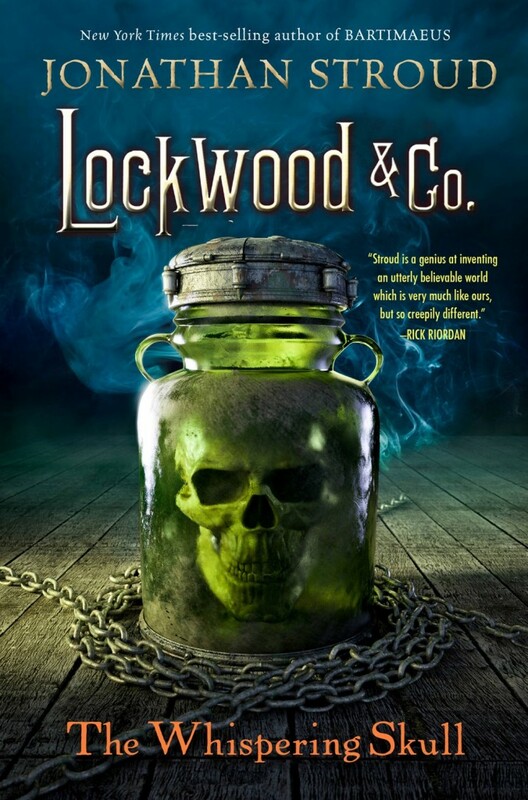 So all in all, the deeds were dastardly, the rapiers of both steel and wit razor sharp, and the ghosts creepy as ever, as once again Stroud serves up a delightful scrum of humor and fright – all the while evolving the partnership of our Lockwood three. So really, I have only one thing left to say – and that is, when does the next book come out, again? This series has everything I could want in a middle grade series. Great characters, a thick plot full of turns and action orientated scenes, and a setting that I love – a historical London ridden with a ghost problem. Most of all, I’m intrigued by Lockwood and his mysterious ways, I feel Lucy’s pain in not knowing enough about him but feeling compelled to want to learn more. Rousing adventures for young tomb robbers and delvers into realms better left to the dead.